Scroll saw portraits can be created from virtually any existing image — a photograph, an illustration, a drawing. The artist begins by rendering the original image into digital form, if necessary, using a flatbed scanner and a computer. Using modern image processing software, such as Photoshop or Paint Shop Pro, the artist modifies the image, first changing it into grayscale, then altering the contrast and brightness settings, to arrive at an image in pure black and pure white. A printed copy of this modified image becomes the artist’s pattern. The resulting pattern is then transferred to the chosen wood medium — usually a thin plywood with minimal grain — and the cutting begins. Each individual dark area on the pattern corresponds to a section which is cut out, and the entire process can take many hours, depending on the complexity of the image. 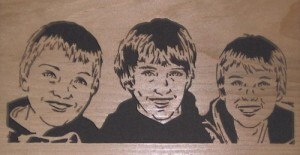 The cutting completed, a finish is then applied to the work, followed by a dark paper backing to provide contrast and make the image stand out, as shown in the above example by Jim, a portrait created from a photographic original of the three boys. 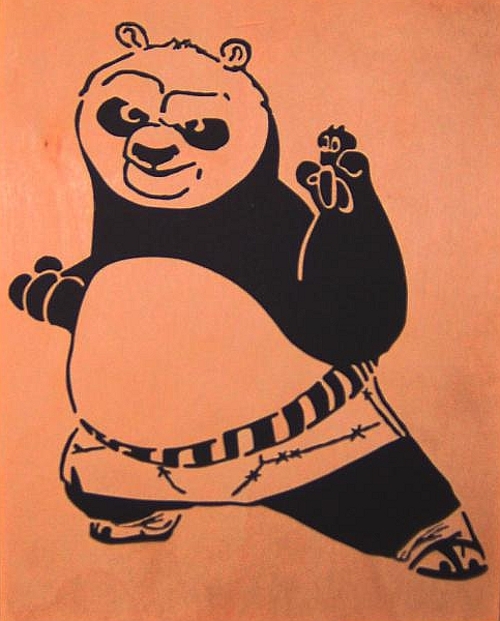 Jim has completed numerous commissions for scroll saw portraits, covering a broad range of subjects, including people, landscapes, fantasy pieces, and even a few famous animated characters. The visual brow features some of these https://college-homework-help.org/ ways.